> Bossa Nova Investimentos led an undisclosed investment in Brazilian accelerator ACE (formerly Aceleratech), and will offer R$300k-R$500k to startups graduating from the program as part of the partnership. Acelera Partners is a previous investor in ACE. > Argentina-based venture capital fund Alaya Capital Partners announced plans to invest US$16m in early stage companies in the technology sector with the goal of scaling them in the Latin American market. > Arfintech is a new fund formed by Argentine banks Macro, Industrial, Banco de Servicios y Transacciones BST, Supervielle, San Juan, and Piano, with involvement from NXTP Labs. The fund has invested US$800k across five fintech startups, including one blockchain startup, to date. > Fip Inseed Fima, the environmental innovation fund (Fundo de Inovação do Meio Ambiente) created by BNDES and managed by Inseed Investimentos, invested R$6m in Solis, a Brazilian solar heating startup. > The IFC, a member of the World Bank Group, is considering investing up to US$2.25m in Koin, a Brazilian payments platform for people without credit cards, to fund the company’s expansion plans. > DILA Capital and Mountain Nazca led a MXN$16m investment in Mexico's shared transportation startup Urbvan. > TPG made an undisclosed investment in Brazilian agtech startup Solinftec through TPG ART, the firm’s Alternative and Renewable Technologies growth equity platform. For more on agtech investing in LatAm, READ this special contribution from SVB's Jackie Hyland. > Distrito Ventures led an undisclosed investment in Monetus, a Brazilian digital asset management platform focused on small and medium investors. > The Jalisco government, along with local DFIs, investment funds, and corporate investors, is preparing to launch Mexico’s first social impact bond which will focus on empowering women to become economically independent through SMEs. > The MIF/FOMIN and Impact Hub Global partnered to invest US$1.5m in up to 180 entrepreneurs from El Salvador, Honduras, and Nicaragua. > #CHANGETHERATIO: Gray Matter Capital’s coLABS, an early-stage R&D portfolio focused on improving the lives of women, made an undisclosed investment in Colombian outsourcing startup LikeU. > LEAPFROG TECH: Fenix International, a San Francisco-based startup making solar power systems for people with no access to electricity grids, partnered with Africa’s largest wireless carrier to connect 1 million new users over the next three years. Customers will use MTN’s mobile-money app to pay as little as $0.20 a day until they own the solar panel and battery system, which is about the size of a personal computer and helps people charge mobile phones and light up homes. > Primatec acquired Rockhead Estudios, a Brazilian gaming company, for an undisclosed amount. > Accenture acquired Concrete Solutions, a Brazilian cloud computing development platform, for an undisclosed amount. > 71%: Percentage of SaaS startups in Brazil that are self-funded, according to Brazil SaaS Landscape Research, a new survey by SaaSholic, Rock Content, Signal Hill, and Redpoint eVentures. > US$31m: Amount of VC dollars invested in Peru in 2016, according to LAVCA data. READ more in our Market Spotlight: Peru VC. > 108 million: Number of young people in Latin America and the Caribbean. 20% of them are neither working nor studying, according to Americas Quarterly in Today's Latin American Dream: A Decent Job. > 62%: Percentage of digital media sites in Argentina, Brazil, Colombia, and Mexico with at least one female founder, according to a report by Sembra Media. > US$93b: The size of SoftBank’s newest fund. Check out Business Insider’s running list of SoftBank investments since 2015. > Brazil’s Senate approved US$750m in financing for renewable energy, provided by the Brazilian Development Bank (BNDES) and the Inter-American Development Bank (IDB). > Bluesmart crowdfunded a second successful Indiegogo campaign, raising over US$1.6m for its second edition smart luggage. Bluesmart investors include monashees+, Tsing Capital, and Endeavor Catalyst. READ LAVCA’s interview with co-founder and CEO Diego Saez Gil. > CBInsights named Ipsum, a startup accelerated by Wayra Chile, the accelerator of Telefonica Open Future_, as one of 100+ startups transforming the global construction industry. Ipsum is founded by Franco Giaquinto and provides project management software to clients in Chile, Mexico, Colombia, and Paraguay. > Entrepreneur.com features Buenos Aires, Shanghai, and Tel Aviv, in: Silicon Valley? Try Silicon Worldwide. > Motherboard looks at Quinto Andar and GetNinjas in: Local Apps Are Letting People Automate Brazil’s Notorious Bureaucracy. > Gateway House: What do India and Argentina have in common? The parallels are becoming more apparent as both countries' ecosystems gain momentum. > Bloomberg looks at the rise of surveillance tech in Brazil in: Ankle Bracelets Are Brazil's Newest Must-Have. > Americas Quarterly: What's It Like to Be 18 in Latin America? They are the first raised in a Latin America where the middle class outnumbers the poor. They are far more connected to the world via those ubiquitous smartphones – and have higher aspirations to match. About 84 percent of them believe they’ll reach their professional goals more easily than their parents did, according to a global survey by the Citi Foundation. No other region was more optimistic, the poll showed – not even Asia. > The Atlantic: Have Smartphones Destroyed a Generation? I call them iGen. Born between 1995 and 2012, members of this generation are growing up with smartphones, have an Instagram account before they start high school, and do not remember a time before the internet. While entrepreneurs and executives in the United States are fretting, other countries — including Mexico, Canada and China — are salivating over the Trump administration’s rumblings. Silicon Valley’s loss, they say, could be their gain. > TechCrunch: The Chinese government’s crackdown on the internet continues with the news that Apple has removed all major VPN apps, which help internet users overcome the country’s censorship system, from the App Store in China. > Mitch & Freada Kapor: Can Venture Capital be Saved? > September 20 is the fifth edition of the Venture Capital in Brazil Forum, hosted by ABVCAP, in Menlo Park. Attendance is free for investors as well as portfolio companies of Brazilian fund managers. Check out the agenda and register here. > 500 Startups is accepting applications from Latin American startups for Batch 8. Entrepreneurs can read more and apply here for the 16-week seed program in Mexico City and US$65k in funding. > Telefonica Open Future_ Colombia in partnership with ParqueSoft Manizales is hosting an open call for entrepreneurs to participate in its program Unidos por TIC Manizales. Apply by August 11. > Startup World Cup is hosting its first regional pitch competition in São Paulo on August 31. Past speakers/judges include Steve Wozniak, Alexis Ohanian (co-founder of Reddit), and Guy Kawasaki. Entrepreneurs can apply to participate here. 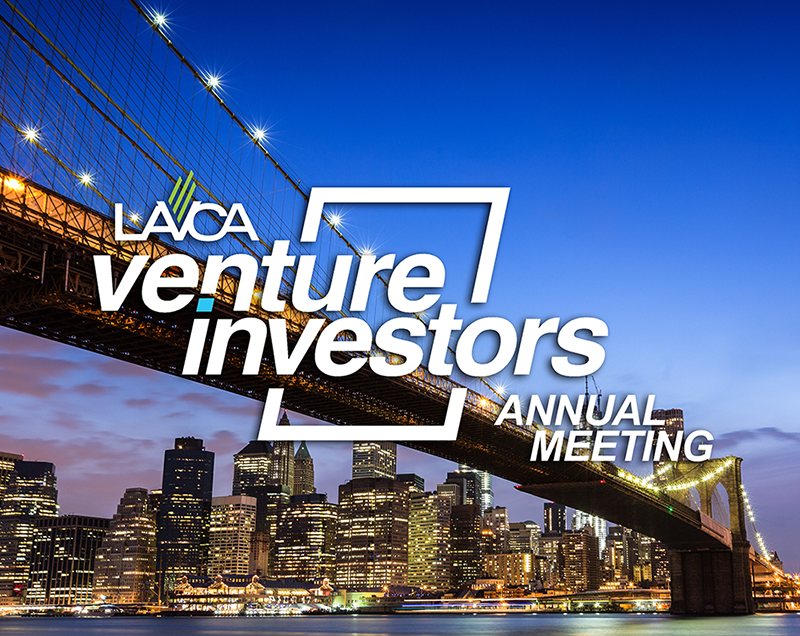 Once a year, LAVCA convenes the community of early-stage tech investors active in Latin America, along with select entrepreneurs, angels, accelerators, and tech companies. The meeting is designed to foster connections among investors within the region and internationally. This year, Josh Kushner, Founder of Thrive Capital, will headline the meeting alongside Hernan Kazah, Co-Founder of KaszeK Ventures, to discuss Thriving Outside Silicon Valley. Panels include The Battleground for Transportation with participation from Easy Taxi, Uber, Cabify, and monashees+, and Spotlight on Agtech with Qualcomm, NXTP Labs, SP Ventures, Agrosmart, and SVB. Additional panels and speakers to be announced. More information here, including past participants. Register, or contact us to see if you qualify to attend.